Note: A portion of the brass may be Nickel-Plated Brass for no extra charge as it is an upgrade! Military Ballistics Industries (MBI) offers these .38 Special rounds an excellent, low-cost supplement to high volume shooters. These remanufactured cartridges are American-made and utilize once-fired brass and nickel-coated brass casings with varying headstamps. Each brass casing is inspected for cracks, thickness, and flash channel dimensions before being thoroughly cleaned and reshaped. The case is then equipped with a non-corrosive Boxer primer from CCI or Winchester and filled with high-energy propellant from Hodgdon. 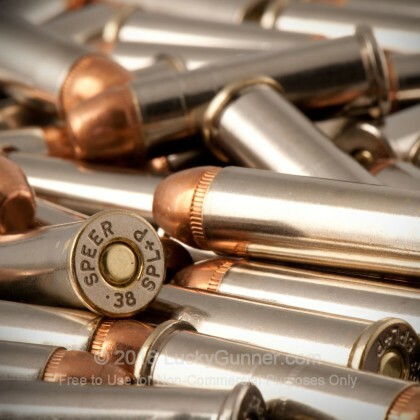 Each .38 caliber round is topped with a 125-grain round nose flat point (RNFP) bullet from Berry's. The RNFP bullet bears a rounded ogive for smooth cylinder insertion, a flat nose that produces clean holes on target, and a toothed cannelure which resists jostling recoil in order to preserve accuracy. 125 grains is light for the caliber and will provide manageable recoil for practice and plinking, even with J-Frame sized revolvers. CAUTION -- This product is considered “remanufactured” ammunition. Compared to factory new ammunition, remanufactured ammunition can have more instances of high pressure, case-head ruptures, squib loads, failures to fire, failures to eject, and other functional issues which, in turn, can lead to damage to your firearm and potentially severe injury or death to yourself or others nearby. The use of remanufactured ammunition may also void the warranty on your firearm, therefore review your firearm’s owner’s manual or contact the firearm manufacturer with any questions. Do not supply this ammunition to third-parties unless you first inform them that it is remanufactured ammunition. I shot these in my Ruger LCR. Shoots good, accurate, reliable. No misfires. I will definely purchase again, when available. Very nice ammo quality...nice for the price! I've shot a couple hundred rounds of this .38 Special MBI and have found it to be excellent qauality and clean burning stuff. We orderd another 500 to fill up the safes. Good stuff and excellent value IMO. First time buyer, wanted to give Lucky Gunner a try. I'm not disappointed. Good price, very quick delivery - ammo shoots well. I will definitely buy from them again! I don't know what other reviewers were shooting but I found this ammo to be neither cheap nor good. 99 rounds were acceptable, loading felt consistent (no noticably weak or hot rounds) and my groups were OK. The powder was unusually dirty, lots of smoke and powder fouling on the weapon. One round had an improperly installed primer (kind of tipped and mashed) and leaking powder. Speaks to poor quality control. No complaints with LUCKY GUNNER. Great range ammo for target practice. Good price, shot well with no problems. Will order some more! 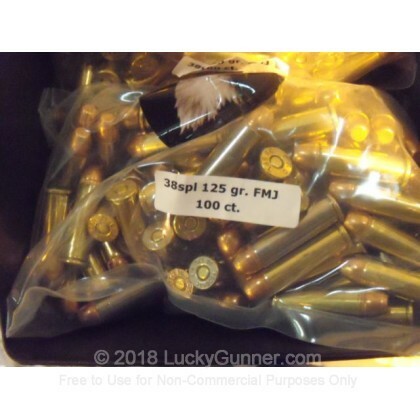 A day after ordering 500 rounds of this ammo for my new S&W 642, I found a negative posting by a person on another forum regarding the MBI. He stated that upon his inspection, 40 of his first 200 rounds were not fit to be put into his gun, and even had a photo of one of the rounds showing a cracked cartridge! Needless to say, I was a little concerned. When I received my order, I proceeded to rip a couple of bags open and carefully inspect the rounds for myself. Although clearly remanufactured (as advertised), I visually saw nothing that gave me any concern. I have subsequently put 200 rounds through my gun, and the ammo has performed flawlessly. At this point I will have no hesitation ordering more, especially given the great price. LuckyGunner also promptly filled my order and shipped the product. Great people to deal with. Shoot 50 rounds today no problems. Fast shipping. Bought 500, shot about 125 first time. Good ammo. No misfires, loads OK, shoots very nice in my Ruger. Great practice ammo. Not one miss fire. These are great bullets. They even had a little kick to them. I was shooting a old 5 shot snub nose concealment gun. That old Taurus makes a lot of noise. But I did get a great grouping. My palm was a bit bruised the next day. The grip is small and hard wood. recieved my order in a timely matter and everything was great, thanks lucky gunner!!!! I Don't mind the mixed bag of cases as long as they shoot well. Shot 200 rounds in my 357 snub with no problems. I bought a 1000 rounds because i'm going too front sight for a refresher & needed 800 rounds. Had no problem with these rounds. Used them in my Ruger GP-100 6" 357. Only shot 100 rounds so far but seem to be as good as over-the counter ammo. Functioned very well, no misfires, and accurate too. 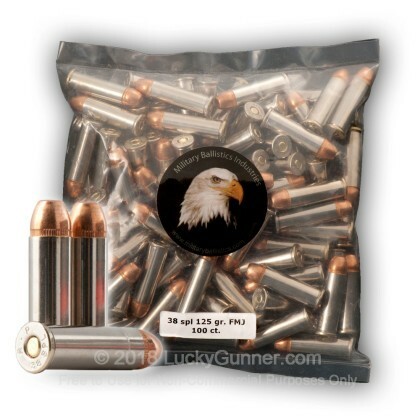 luckygunner is the BEST place to buy ammo!!!! Great for target and practice shooting. No problems at all. Great service too! Shot 200 rounds out of Ruger speed six. No problems at all. Please click here for our current in stock specials on .38 Special!